Dogs Trust's eleventh annual Stray Dogs Report¹ has revealed that an estimated 96,892 stray dogs were taken in by local councils in the UK last year, 6,710 of which were put to sleep for want of a home. In fact, on average, eighteen dogs are put to sleep every day². Despite the sustained efforts of animal welfare organisations and local authorities, on average 11 stray and unwanted dogs are handled by local authorities every hour. And every 80 minutes, a dog is put to sleep. Please consider visiting your local rescue centre before splashing the cash on a rental Rover. 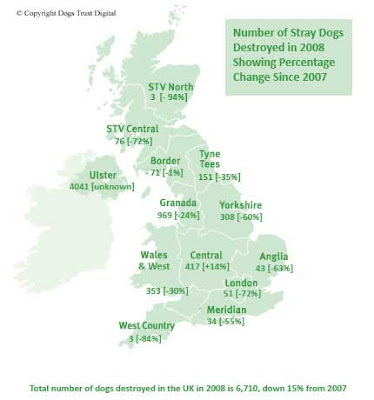 "This is the first year that the number of stray dogs in the UK has dropped below 100,000. But this is still far too high a figure - it's 6,000 more than the number of seats at Wembley! For a nation of so-called animal lovers, it is unacceptable that pets are being treated as throwaway commodities. Dog ownership is a privilege, not a right. "Dogs Trust is working closely with local authorities and runs extensive education, neutering and microchipping campaigns to help them tackle the issue. As a result the number of stray dogs has dropped gradually in the past ten years. "However, the onus remains on owners to accept their responsibility. Get your dog neutered and microchipped and ensure he is wearing an ID tag so that if he is lost he can be reuinited with you more easily." To learn more about adopting a dog from Dogs Trust, please visit our website. ¹Conducted by GfK NOP on behalf of Dogs Trust. ²Some of these will have been euthanised because of aggression or illness.